Molly Bloom (Jessica Chastain) was an Olympic-class skier who ran the world's most exclusive high-stakes poker game for a decade before being arrested in the middle of the night by 17 FBI agents wielding automatic weapons. Aaron Sorkin has dominated our screens (big and small) for so long it’s hard to imagine that Molly’s Game is his directorial debut. However, we remain on familiar ground here - there is no mistaking who is telling this story. 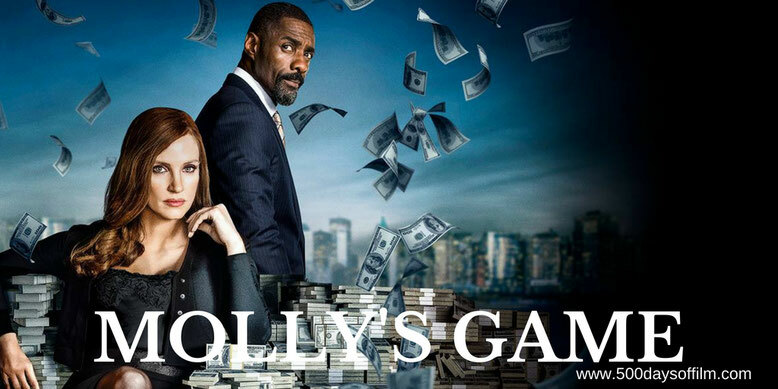 Indeed, Molly’s Game is the very definition of “Sorkin-esque” - an intriguing story told via a smart and loquacious script, delivered by an impressive cast at (of course) truly staggering speed. Hats off, then, to Jessica Chastain who has to do most of the (exposition) heavy lifting. Proving, once again, her emotional intelligence and on-screen charisma, Chastain is more than up to the challenge. Idris Elba also (naturally) commands the screen as Molly’s lawyer, Charlie Jaffey. However, it is Kevin Costner who makes the most welcome appearance as Molly’s father, Larry. Costner injects (particularly in a scene near the end) some much needed passion into a film strangely devoid of heart. As with his writing, Sorkin’s direction is punchy and fast paced. However, Molly’s Game lacks the emotion to elevate this film from good to great. Molly’s story is endlessly intriguing and yet, despite Chastain’s powerhouse performance, I never truly connected with her character. In addition, Sorkin’s film stumbles somewhat in its depiction of Molly’s complex and entrepreneurial poker business. Molly’s Game tries to explain the inner machinations at the centre of the games but these interludes only served to pull me out of the drama and remind me of the film’s long (long) two hour and 20 minute running time. However, overall, Molly’s Game is a fascinating and entertaining debut. I’ll certainly be first in line to watch Sorkin’s next turn in the director’s chair - you can bet on it. The real nightclub where Molly’s poker games started was Hollywood’s infamous The Viper Room. Idris Elba’s character of Charlie Jaffey was fictionalized by Sorkin to serve the story. Molly’s real lawyer was Jim Walden. The character of Player X (played by Michael Cera) was based on actor Tobey Maguire. Have you seen Molly’s Game? If you have, what did you think of Aaron Sorkin’s directorial debut? Let me know in the comments section below or let’s chat over on Twitter. You can find me @500DaysOfFilm.